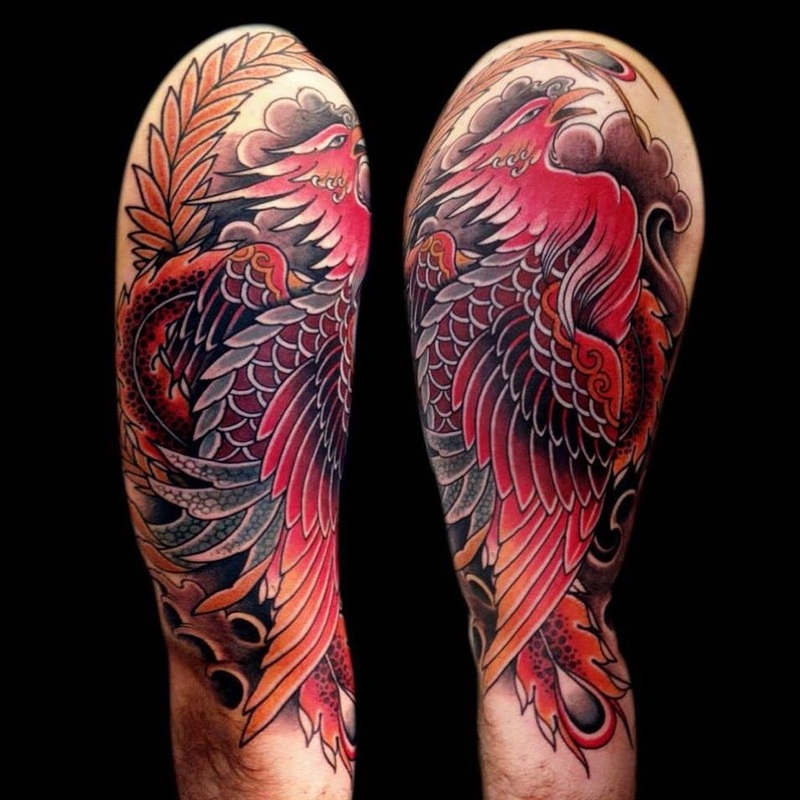 There are many tattoos that have a cultural and spiritual meaning and the Phoenix tattoos are among them. 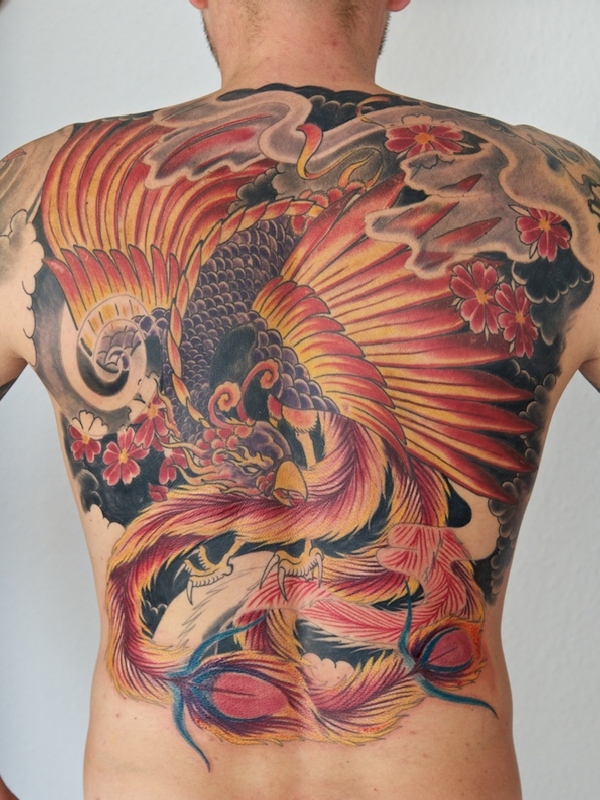 These tattoos originate from the Japanese culture and they have been adored by people for many years. This tattoo was originally drawn by the Japanese and it had specific meanings. It was mostly drawn as a spiritual symbol and was used as a protection. In some situations, it was used as a form of punishment. This was similar to the Romans, where the prisoners, slaves, and criminals were marked with tattoos. The tattoos were applied as a way of marking a certain group of people. Nonetheless, the tattoos were later on applied by people of a higher ranking in the society. Many other people applied the tattoo as a sign of a spiritual protection. These tattoos were drawn to represent a unique bird, the Phoenix, which was consumed by fire, then it rose from its own ashes and lived. Basically, there are of different origin other than Japan. It is also believed that the phoenix also came from China, but they all have a common meaning. The tattoo was used to symbolize triumph, a renewal, rebuilding, and rebirth. It was used to signify a new beginning in the life of the wearer. 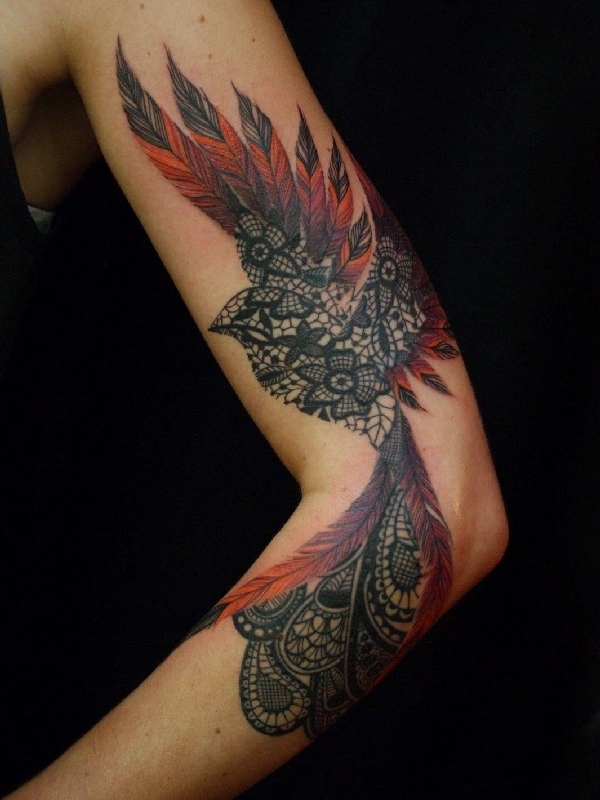 Phoenix tattoos are normally very attractive in nature and they are overly astonishing. The phoenix almost resembles the Native American Thunderbird, but they have different meanings. It mostly means the rebirth or rebuilding of a person. This is because the bird was able to renew itself from the fire. It went through a process of recreation. The bird would set itself on fire and construct an egg from the ashes, where a new phoenix is hatched. It is strongly attached to the spiritual life of a person. With the special ability of this tattoo, it also has some specific areas that it is commonly applied to. 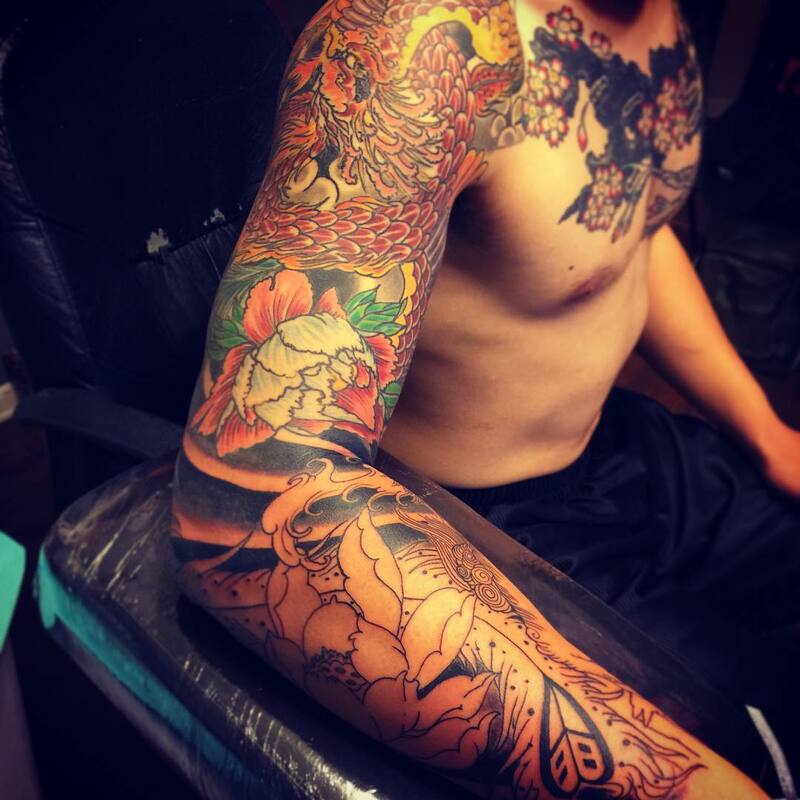 In most cases, people will apply the tattoo in large sizes. This is mostly because it had more details and it looked better when in a larger size. For that, these tattoos will be applied to the chest, the leg, back, arm or the shoulders. They tend to entail some artwork and color details, so they mostly look better when in larger sizes. They can also look good in smaller sizes. However, the smaller sizes must be drawn by a professional. This is because they have a complex design. The smaller tattoos are mostly applied to the lower part of the leg, near the ankle. The feathers will then spread to the other part of the leg. The phoenix with the long feathers will mostly be applied to the chest area of a woman. There are many versions of the phoenix drawings. Most of the tattoos will be drawn in larger sizes. For the smaller tattoos, the Greek version is the best choice. The Greek phoenix will be drawn with peacock feathers, which will still look elegant. Here is a look at the other common types of the phoenix drawings as tattoos. Lone tattoos. The lone phoenix version is that which the bird will appear alone. Even though it might seem simple, this tattoo is super elegant. The tattoo can be drawn to cover the entire back and it will look amazing. In most cases, this type of tattoo will be drawn by men and will not have many color details. Phoenix and egg tattoo. This type of tattoo is very astonishing and they come in a very elegant design. This is a great choice if you intend to give the real symbolism of the rebirth of the phoenix. It is mostly used to show a new beginning in the person wearing it. 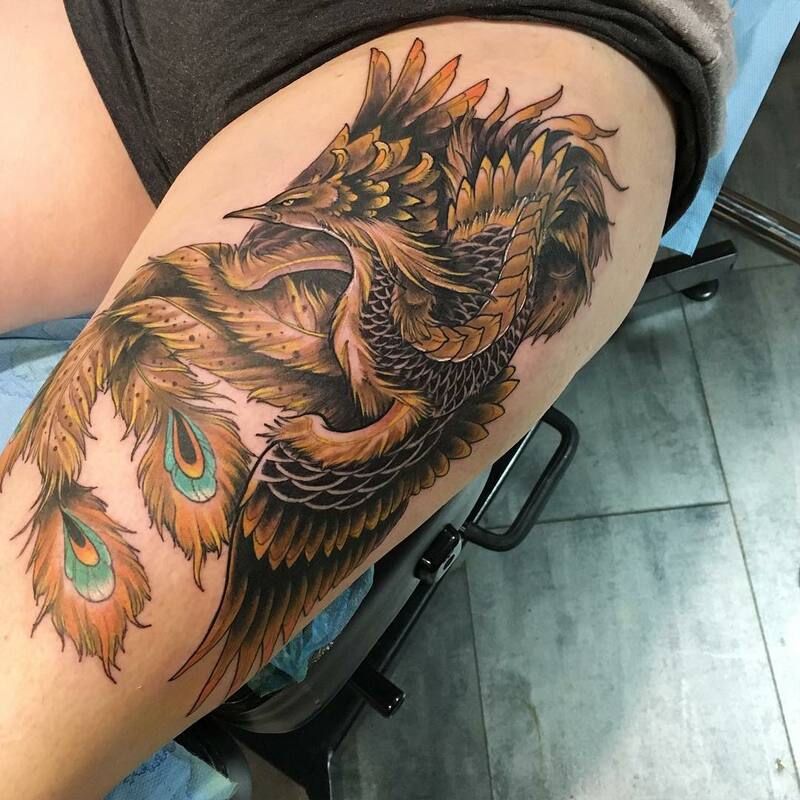 Phoenix on fire tattoo. 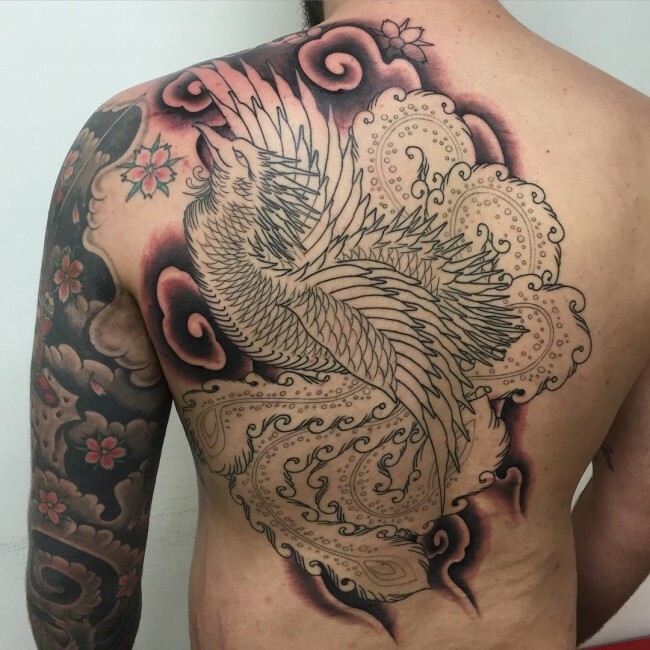 The phoenix on fire tattoo shows the process of the rebirth of the phoenix. Originally, the phoenix had to burn itself to ashes. After that, it will start forming an egg through the fire. This specific type of tattoo will symbolize the end of a the first process of the renewal or rebirth. It also shows the introduction of a new stage. This tattoo will take a bigger part of the skin, so choose the placement wisely. Phoenix and Chinese dragon tattoo. 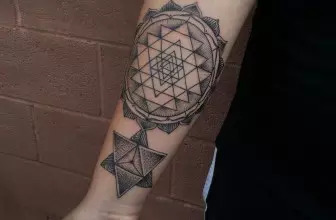 This type of tattoo has a unique meaning and it also comes in a bigger size. Regardless of the significant meaning, the tattoo has a super elegant design. The two creatures can look astonishing on the skin. In the Chinese culture, they consider the phoenix to have some male and female aspects. When the phoenix is represented by a dragon, it will symbolize a female counterpart. These tattoos are mostly applied by lovers and they tend to have some extra color details. Greek phoenix. These are the tattoos that will look better if they are drawn in smaller sizes. They will most likely appear in gold and red. Historically, these tattoos were described to have the size of an eagle. The eagle had gold and red feathers. They are also responsible for the symbolism of the phoenix that had the peacock feathers. These are the ones that are most commonly applied by people. Phoenix metamorphosis. These tattoos are very special, in design and meaning as well. The process of the phoenix is not exactly explained, but it is referred by many as the metamorphosis. The phoenix characters that had this symbol were used to show the process of birth. They will be applied to show the process of the rebirth of a person. In most cases, they will show that the person is in the final tough stages of a stage. They represent when the egg was cracking and a new phoenix was coming out. Generally, these tattoos are very elegant in the design and they come with unique meaning altogether. The type of the phoenix will determine where it will be applied. The bigger and mostly those with two creatures and characters will be applied to the back or the chest area. Nonetheless, they can be applied anywhere and will still look elegant. Always ensure you understand the meaning of that tattoo before you apply it.